I’m thinking a lot about superheroes these days. But I haven’t seen "The Avengers" or any of the other high-tech fantasy adventures that flood the big screens worldwide. Long before the magic of CGI and Obi Wan Kenobi, I already had two mighty warriors in my life to emulate every day--the two people with me in the picture above. Do me a favor and try not to notice that my frizzy hairstyle in this shot makes me look like a teenaged possum, and that my eyeglasses look like two Cadillac headlamps. That picture was taken one summer morning in 1987 on the Hawaiian island of Maui, just after dawn, when the sun pierced the fog and mist atop Mt. Haleakala. 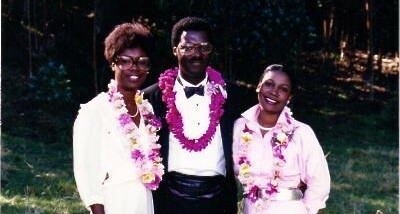 I was there for my oldest brother David Stewart-Jones’s wedding, along with my oldest sister Julie Newell. In hindsight, I realize I stumbled across this photo recently for a reason. David and Julie were two of the most powerful role models I’ve ever had, coming from a poor African American family with 10 children in a small southern Illinois town. They both set the tone for how I would or should move through the world. Julie was like a second mother to me. She helped raise all 7 of her younger siblings, taught me how to be poised, assertive, and proud. She was a school secretary for over three decades, but Julie's outspoken, indomitable spirit propelled her towards the top ranks in the state Teachers’ Union, and eventually to several national committees. Julie was the toughest person I’ve ever met, and fought cancer and lupus and many other ailments like a junkyard dog until the bitter end, with that same poise and strength. Cancer took her, and a good chunk of my heart, in 2007. But by then depression had already taken David, back in 2003. He was the “Jones Family Hero,” brilliant, funny, articulate, sophisticated, successful...everything I always wanted to be. He was the one who helped integrate the public schools in Cairo, Illinois back in the early 1960’s, and endured hateful, vindictive treatment dished out on a daily basis. He was the one who graduated from Cairo High School as its first black valedictorian in 1965—and who had to swallow his pride and emotions when the school canceled the valedictory ceremony rather than give the honor to him. David was the one who won a full scholarship to the University of Chicago. Then he lived all over the country, traveled all over the world, in his banking and consulting career pursuits. I’ll never forget the excitement I felt as a young girl going to visit my big brother in his 24th floor apartment in downtown Chicago, on North Michigan Avenue--the Magnificent Mile. It was “dee-luxe,” and David was magical. After all, he could pick up the phone, order exotic sounding food like moo-shu pork, and it would magically arrive at his door! Or he could take us to baseball games, or to the Field Museum, without worrying about how much it cost! He could regale us for hours with stories about his trips to far-away countries, or tickle our funny bones with his ascerbic humor, gilded by his deep, rumbling, snort-like laughter. David always occupied a broad, gilded pedestal in my mind—lofty, revered, aspirational. He was the Black James Bond, the Melanin MacGyver. That’s why I could never even begin to imagine that he might need help, or feel anxious, afraid or depressed. I could never envision him worried about failing, dreading the next tyrannical phone call or slammed career door. He was invincible. That’s why I’ll never quite get over the fact that in March of 2003, something knocked the wind right out of his soul, and David decided he didn’t want to be alive anymore. But how could he? Our family, his friends, his professional field—heck, The World—needed the mind and wit and charm and poise of David Lewis Stewart-Jones. Why couldn’t he keep wrestling with whatever was roiling in that beautiful mind of his and just take one for the team? I wish hero-worship could cure the pain of depression. I wish David knew how much he moulded my mentality, inspired my intellect, shaped my will to succeed. But I also wish I had known just how much he must have suffered, and how absolutely impossible it must have been for him to risk muddying the family lore by revealing the chinks in his armor, the Achilles heel, the possibility that maybe he wasn’t a superhero after all. All along, he was grappling with more than just his own demons. He must have shouldered some of ours, too. So that’s where my head is at these days, after spending some time last week pondering the devastating decisions of two extremely famous and successful people. I wish more of us could see beyond the accolades and the titles and the financial success to what is really going on in the lives of our friends, families and role models. But I also wish that everyone who is suffering from and struggling with depression could truly believe that just one more day could make all the difference. Just like the sun that pierced the fog and mist atop Mt. Haleakala 31 years ago, just one more day could reveal another reason to hang on. Both of my first superheroes died at about the same age I am now. And when I realize that I’m just now figuring out this game of Life, finally feel like I’ve grown into the person I was meant to be all along, I can’t imagine not wanting to see how the rest of the screenplay unfolds. So I live on for Julie and David, my African American Avengers whose lives taught me, in two dramatically different ways, that you should never, ever give up.